HIGH POINT, NC — APRIL 17, 2019 – For over 35 years Mickey Truck Bodies has provided high-quality repair and refurbishing services for commercial fleets throughout the U.S.
Mickey Fleet Services operates company-owned Regional Centers in NC, IL, FL and NJ. The Centers are staffed by experienced technicians and mechanics. In addition to the company-owned Centers, Mickey has partnered with authorized repair facilities from coast to coast. Mickey Truck Bodies also owns and operates a 20,000-sq-ft liftgate installation plant with 15 bays at its manufacturing complex in High Point, NC. “For 115 years, Mickey Truck Bodies has been the most trusted family brand in the truck body and trailer business. Now, with Mickey Fleet Services, customers can count on us for even more,” says Tucker. Joe Sebbio, the owner of Salem, OH-based Mobile Automotive Repair Service, has successfully repaired so many ambulances over the past 40 years he can hardly keep track. But the unit he was most impressed with was one that could not be repaired. 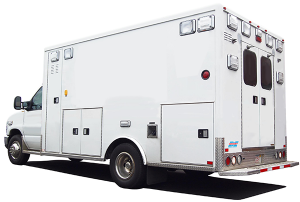 It was a 1997 AEV mobile intensive care unit upfitted from a Mickey Truck Bodies module and mounted on a Freightliner FL60. The vehicle rolled over taking a curve at a high rate of speed while on route to a patient pick-up. The unit was still on its roof when Joe arrived at the scene. Rear door frame before and after the Mickey touch. Like all agents for North American Van Lines, Bloomington Relocation Systems (BRS), an award-winning central Illinois moving company, has a reputation for delivering “what we promise: a smooth, easy, personalized moving experience. 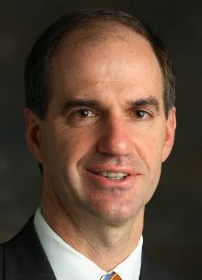 “We take our commitments very seriously,” says Kelly Lembke, BRS President. So, it makes sense that the company would trust all its aftermarket service and repair work to the Mickey Fleet Services Center in Bloomington, IL. 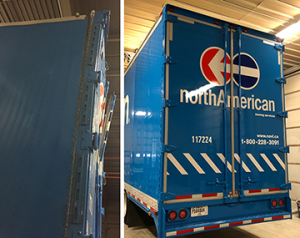 Recently one of the BRS moving trucks was “topped off’ under an overpass, causing significant damage to the rear door frame, roof rails and roof bows, and roof. Samaritan’s Purse body by Mickey. When disaster strikes, it’s always comforting – and sometimes lifesaving – to have a Good Samaritan nearby. Eighteen times last year Samaritan’s Purse, a nondenominational evangelical Christian organization based in Boone, NC, was on the scene providing spiritual and physical aid to victims of various natural disasters, such as hurricanes, tornadoes, floods, ice storms and wildfires. 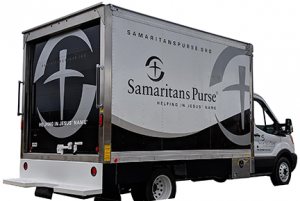 Samaritan’s Purse mobile disaster recovery teams and equipment are strategically placed at partner support churches throughout the nation so they can respond quickly and efficiently to natural disasters. “We want to reach the people who need help as quickly as possible and get them cleaned up, back on their feet and back into their homes,” says Luther Harrison, Vice President of Samaritan’s Purse North American Ministries. The Samaritan’s Purse 12-ft Mickey bodies are mounted on Ford Transit 350s with four tires on the rear axle, two on each side. The customer designed a special “walk-up” bumper that enables the volunteers to lift heavy items out of the back without having to lean over a conventional step bumper, Forrest explains. A synthetic floor with drain holes, custom-formed scuff liners and Kemply walls allow for the inside of the body to be easily cleaned following disaster recovery. The bodies are upfitted with undermount stainless toolboxes help to keep fuel and other combustible items separate. 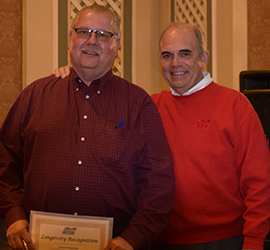 Greg Spainhour (Beverage) became the newest member of the Mickey Truck Bodies 40-year club when he celebrated that anniversary milestone on February 2, 2019. He joins Debbie Deal (Sales), Rocky Barham (Parts), Mike Rabon, Sr, (Beverage) and Michael Johnston (Costing) in the prestigious group. Twenty-six percent of Mickey’s 400-plus full-time teammates have been with the company for at least 10 years. Thirteen percent of the entire Mickey team has been with the company for at least 20 years. 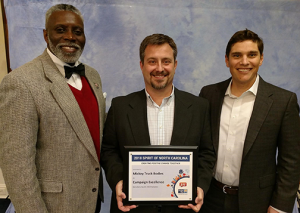 Joe Barnes (l), United Way High Point, presents 2018 “Spirit of North Carolina” award for “campaign excellence” to Mickey’s Steven Proctor (c) and Matt Sink. From 2013 to 2018 the Mickey team contributed over $723,000 to United Way. During each of the 6 years there was a 100% participation rate among the Mickey team in High Point. Mickey is the only manufacturing company in the 90-year history of the United Way of Greater High Point to achieve a 100% employee participation rate for 6 straight years, according to Joe Barnes. The Mickey van body on a Ford chassis with Roush CleanTech’s “Low Nox” propane system made the rounds on the Spring ’19 convention circuit, appearing at BevOps in Las Vegas, NTEA in Indianapolis and the Western Propane Gas Association’s “Propane Day” in Sacramento. 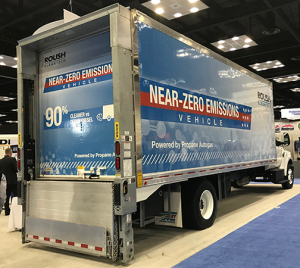 ROUSH CleanTech and Mickey Truck Bodies have collaborated on a range of propane-powered trucks for many different customers across several industries. Tucker’s Takes: What’s in a name? If you are reading The Mickey Spirit from top to bottom, then you know by now that we have changed the name of our Reconditioning & Service business to Mickey Fleet Services. What’s in a name? you may ask. Everything. And by everything, we mean every aftermarket service we offer our customers. When we started in the repair business some 40 years ago, we focused on restoring and refurbishing beverage bodies and trailers, mostly sideloaders. That’s what we built, that’s what we knew. But just as our manufacturing expertise and diversity has expanded significantly over the years, so too have the aftermarket services we provide. Today our regional centers repair, refurbish, upfit, install liftgates, paint, remove and apply decals. We do body work, brake repairs, bulk trailer cut downs, chassis modifications. We sell parts for any make and model. We are handling fire trucks, construction equipment, buses, emergency vehicles, food trucks, furniture bodies, sanitation equipment and many types of van upfits and van conversions. And, of course, we can still make your 15-year-old beverage sideloader look and work like new. We are Mickey Fleet Services. All fleet services. On a final note, congratulations to Greg Spainhour, our latest teammate to celebrate a 40-year anniversary working at Mickey. Forty years is an incredibly long time to work at the same company. That kind of loyalty speaks to two facts: 1. Greg Spainhour is an outstanding employee; and 2. Mickey Truck Bodies is an outstanding company to work for. Over 36% of Mickey’s 400-plus full-time teammates have been with the company for less than 2 years, while 26% have at least 10 years of Mickey service. Thirteen percent of the entire Mickey team has been with the company for at least 20 years. Celebrating 30 years (from left): Dean Sink, Rex Cook, Brent Barricks, Ricky Bean, Herb White, Carl Mickey.